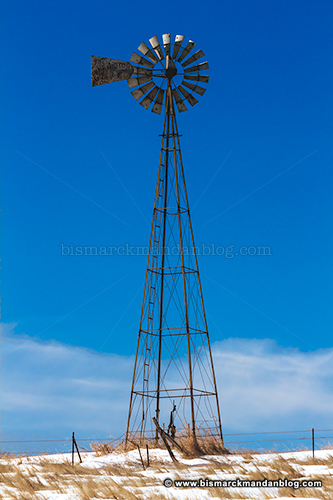 This goes out to my online pal Jason, who challenged me a while back to deliver a) a windmill photo, and b) a broken-down farm building photo. What I haven’t posted, due to things being a little busy around here, are my responses – acquired on May 26th, 2014. 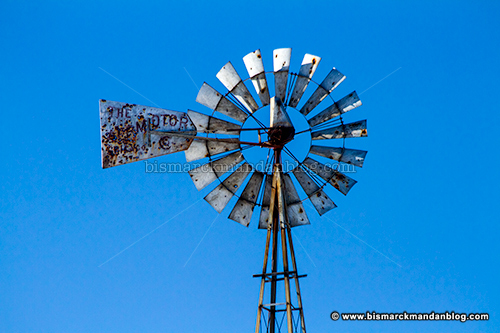 First, I’d like to present the windmill above. 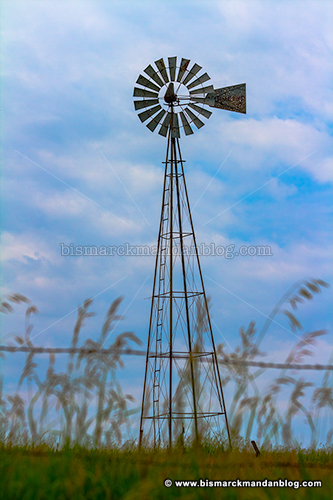 This is one of my favorite windmills, but I didn’t just dart out to it in order to satisfy a request. This was actually on the return leg of the previously posted trip with my little boys, when I had my youngest out southwest of Mandan. 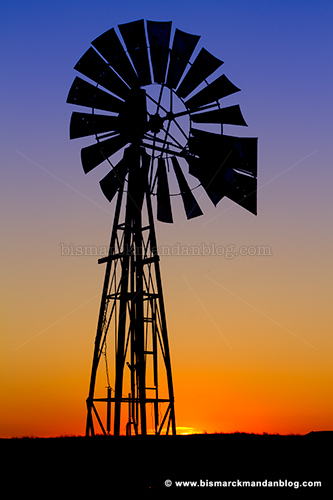 In fact, I have already posted an additional windmill photo from that trip, the one with the damaged fins…but I’ve been meaning to share this one just because the colors were so dynamic. 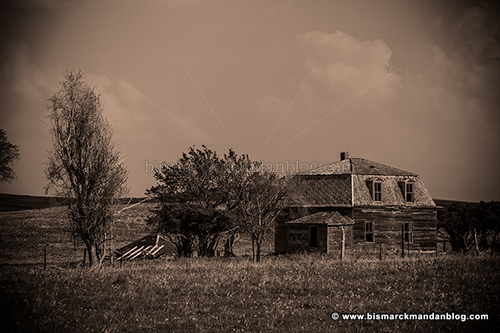 Next is this old house and the remains of its garage, which sit along the road to Fish Creek Dam. That’s where I took my little guy to show him the bench out on the lookout point – if you don’t know about it, I’ll have to post a little explanation later. I’ve wanted to approach this house for a while, and the land isn’t posted, but there are currently cattle on the land. I guess I’ll have to wait, and let this shot from the road suffice for a while. I’m on the mend now, and while I act as a recliner pilot and nurse the wounds from my most recent DaVinci robot attack, I’m going to try to dig back through the hard drive for shots like these. I have dozens of photos I’ve taken with every intention of sharing here, but have somehow neglected or forgotten over time. I think I’ll find some gems in there, and for the next few weeks I’ll have plenty of time on my hands to work with ’em. 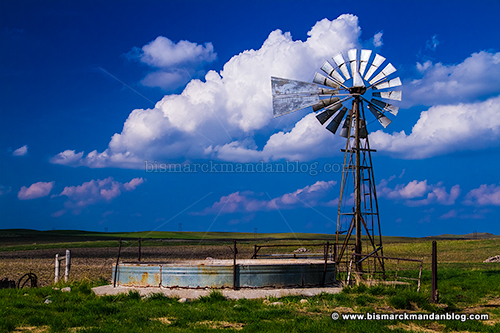 This Morton County windmill has seen better days. I spotted it in this condition while driving by with my littlest boy. He wanted to go home after a good afternoon of photo hunting, so I didn’t take the time to get any closer for a shot. I switched to a 300mm lens and snapped this from the road, then took off for home (and dinner). Yes, it’s been pretty darn cold. Even many of my fellow North Dakotans are starting to whine instead of brag. 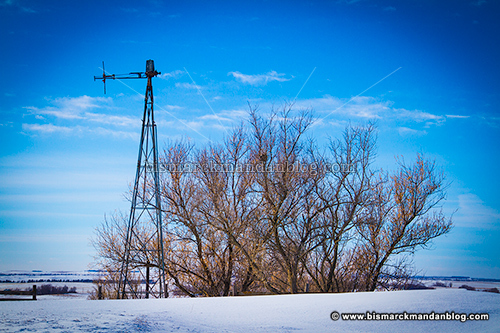 I did manage to get out for a brief photo trip the other day, and of course I had to go to an old standby: my favorite windmill. I haven’t been able to do much in the way of photography, which means long stretches in between blog posts and nothing but regurgitated political stuff on Facebook. Sorry ’bout that. I am hoping to stretch my legs more photographically here in the near future. In the mean time, however, here’s some cold metal. And some cold wood, I suppose. 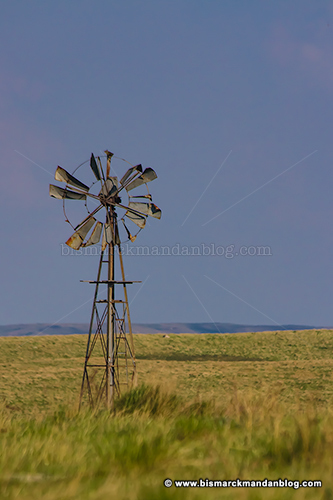 Although, in order to maintain my self-deprecating joke about always photographing windmilss, I did manage to sneak one into the background. One thing we’ve been short of lately is photogenic clouds. Ironically, those dry, hot August days haven’t been really conducive for great summer sunsets. In order for the sun to really provide a dramatic sunset, it needs some clouds to bounce its light, create shadows, and fill the sky with color. The other night we got just that kind of clouds. 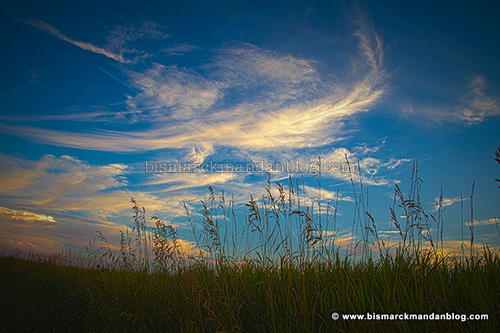 The wispy tendrils of these clouds were of a type I haven’t seen in a while, so I was excited to bolt out to one of my frequent photo haunts to put them into perspective. 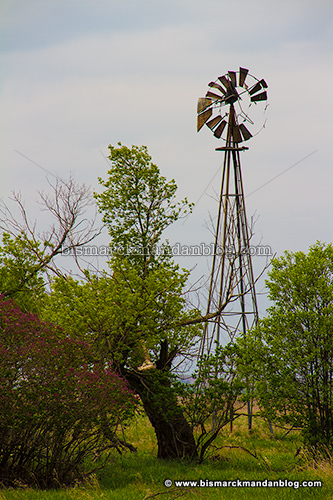 Of course I used one of my favorite foreground features: an old windmill. Now we have too many clouds to do much of a sunset photo at all, but the light rain is also a welcome sight. I didn’t get to chase sunsets much at all for most of this summer, and plan to do a lot more now that I’ve got the opportunity, so when the rainy days pass by I’m sure more shots like this will appear. 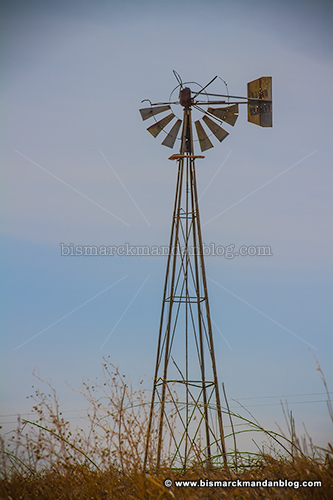 I was out at my favorite windmill location for a number of reasons, but one was to test the sharpness on a lens that I’m considering selling. I’m pleased to report that it performed admirably. Next was to look for some tracks from a midnight critter encounter I’d had in this location recently, but the rain had obliterated any chance of that. Also was to simply take the camera out of the bag, something that hasn’t happened a lot lately and is obvious in the decreased volume of posts here on the ol’ Blog. That was a success. I have a couple of photographic targets in mind for the near future, and with a little luck I’ll have the time and means by which to pursue them and, of course, post the results here. It’s painfully obvious now that this maddeningly busy year of 2013 has taken a huge toll on my photographic adventures. I got a long-needed opportunity to roam recently and, although I’ve done plenty of poking around the area with my camera, found some new features. As usual some windmills caught my eye. Some I marked in the trusty Garmin, and others I chased down. This one was particularly attractive since it was tucked behind some rather nice trees. I grabbed a few quick shots from the section line road and moved along to grab a few others that I’ll share in due time. I’ve alluded to the frustrating fact that I haven’t been able to get out with my cameras in quite a while. 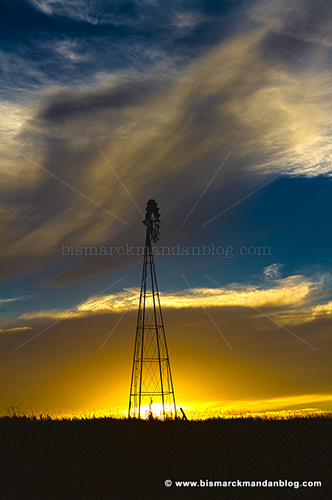 It shows; I’m always eager to share cool North Dakota photos with y’all, even daily if I get them. This photo came from a much needed and overdue photo trip with my little boy. He has a good eye and steady hand, too. 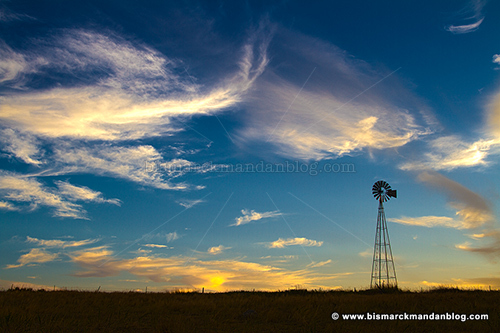 We stopped to take a shot of this windmill (as I’m wont to do) and noticed that only half its blades were still intact. Good conversation, good snacks, four wheel drive, and Daddy-son time were a great way to break the cameras out of the bag and do some roamin’. 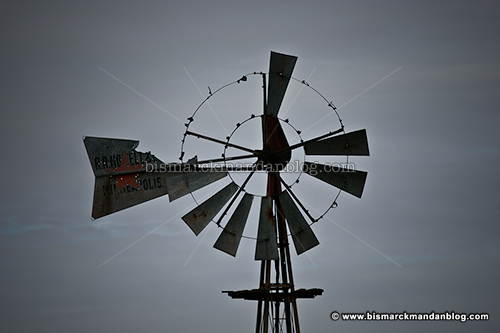 I used to post a lot of windmill photos. Well, I used to post a lot of photos in general, but these days I’ve been doing more work-related and Daddy-related activities. That won’t stop me, though. I was all lined up to do a brief photo trip today when I realized that my little guys wanted to go sledding. In an instant I sacked said photo trip and donned my snow gear for some sledding, sliding, and snowball throwing. What a blast! To satisfy my urge to share a photo with all-y’all (my Texan wife swears that’s a word) I grabbed this one. 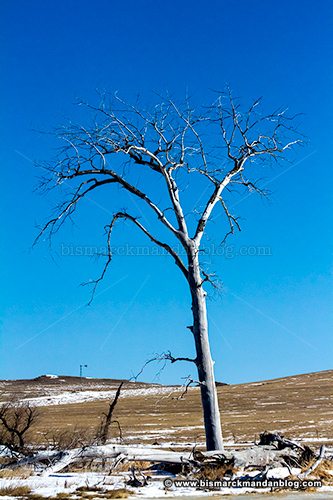 I snapped it on my way back from a freelance photo shoot north of Bismarck, so it certainly isn’t stale. By the way, I don’t do freelance portrait photography; I freelance industrial photography to pay the bills while doing the landscapes and other stuff in my free time. That available free time is harder to come by these days, but I do still find an occasional opportunity for windmill photos to share!